The Whig Government of Lord John Russell had scheduled a decennial ensus in Britain for March 31, 1851. The Census Act empowered the Secretary of State to issue questions about any further particulars that might seem advisable and George Lewis, MP for Herefordshire and an Under-secretary at the Home Office, using this clause, decided it would be desirable to discover some religious statistics.3 Hence, questions on religion were put in the Census form, thus allowing for a penalty for fail­ing to answer. This caused something of a furore in both Houses of Parliament particu­larly from Anglican bishops although no interventions from the Welsh dioceses could be traced (Welsh dioceses were part of the Church of England at this time). The legality and value of these religious questions was doubted and there were complaints that the questions were vague and impossible to answer and unwarranted because they sought information on people’s income. ie endowments. In the event, the questions about endowments were withdrawn and the religious questions separated from the Decennial Census forms. The Registrar General senl a letter to clergy requesting them to co-operate 4 and very few Anglican clergy failed to respond. interestingly this letter was dated March 13, 1851, before the exchanges in Parliament. It can only be described as sycophantic in tone. The criticisms in Parliament did not receive much publicity and none of the Welsh language newspapers and magazines referred to them. The exchanges in the House of Lords were principally objections from the Bishops. However it is possible to interpret these complaints as a pre­ emptive move. Should the returns be unfavourable to the Church of England, this would have been pointed out as fallacious prior to the data being known, rather than as post-event justification. As an official part of the decennial Census, the Religious Census was the responsibility of the Registrar General. The topography of the Religious Census was exactly that of the ‘ordinary’ Census. The country was divided into Registration Divisions and some cut across county boundaries. Thus, some Pembrokeshire parishes are in Carmarthen Registration Districts. However, the Calendar records their geographical county. Three of the parishes under review [Kilrhedin (sic), Clydey (sic) and Llanfallteg] are partly in Pembrokeshire and partly in Carmarthenshire. The population of the Pembrokeshire component of these parishes is given separately in the Calendar, but the attendance figures cannot be differentiated. With a total of three parish churches and six Nonconformist chapels, these may slightly distort data given later. Two forms were used, one for Nonconformists and one for the Church of England. Only English versions were produced. They were distributed to the residences of the officiating minister, deacon or churchwarden by the (Census) Enumerators on March 29, 1851. The census was taken on March 30 and collected on March 31. Any omissions were to be completed by Enumerators by April 8 and forms, after checking and completion by Registrars if necessary, returned to London by April 22. Any further omissions were completed by correspondence with ministers by use of an ‘Informants Form’. This worked satisfactorily and there was a good return from Pembrokeshire as shown in Table l.
Table I: Religious Census Returns for Pembrokeshire. Source: Calendar. Some Church of England responders did not fully complete the forms because, for example, they claimed not to know the nature and/or amount of endowment while others were not willing to give this information. The vicar of Whitchurch did give the information, but regarded the question as ‘impertinent’ .10 The vicar of Manordivy (sic) added to his return ‘a greater fallacy can barely be entertained than for anyone to suppose they will receive accurate information upon the several returns made under these enquiries’. The Calendar adds ‘. . . [he himself gave] information of questionable accuracy’.11 A Registrar, who was curate of the parish, notes for Cresselly Primitive Methodists (Jefferston Parish), ‘from my own knowledge Congregationalists seldom exceed 15 and there are only three persons in the parish who call themselves Primitive Methodists’.12 The returned response had given an attendance of 30-50. A number of returns gave information that was clearly inaccurate, although no special comment appears to have been made. For example , St Mary’s Parish Church in Angle gives its capacity as 31 but its morning attendance as 50-100 and in the afternoon 100-120 plus 42 scholars, while Horeb Baptist Chapel in Henry’s Moat had a capacity of 39 and an attendance of 200. These data emphasise the apparent difficulties of interpreting the question which asked for information on ‘space available· for public worship;’ ‘free ‘ and ‘other’ and also asking for ‘Free Space or Standing Room.’ Several returns reflect these difficulties. A deacon of Bethabara at Pontyglasier reports ‘Gallery plus 26′ whereas Ebenezer, Llanfair­ Nantgwyn says ’34 plus gallery’. Carmel, Clarbeston Road, is ‘ all free’ and Llanllawer Parish Church was ‘ large enough’ (these. data all from Calendar). As stated, Horace Mann was given charge of the Census and reported in 1853. 13 In order to calculate attendance, he used a formula of counting all those who attended morning service plus half who attended afternoon service and a third of those who attended evening service. There appeared to be no rationale for this and presumably was done to reduce the effect of ‘double’ attendances. The formula has been criticised on the basis that it favoured the Church of England where most services were held in the morning unlike Nonconformists who often attended more than one service. Nonconformists were also alleged to have ‘packed out’ chapels on the dayl4 although this is not confirmed by the ‘below average’ atten­ dances reported. Mann defended his calculations on the basis there was ‘no other collection of statistical material for comparing varying practice from place to place and from denomination to denomination’ 15 and it compensated for those who went to church in the morning and chapel in the evening. In a lecture to the Statistical Society he added ‘I am really unable to arrive at any other conclusion that the general facts are substantially correct . . . [any] errors [are] distributed equally over the country’ .16 On the other hand, he also said, when referring to the adjusted data, ‘these figures are mainly conjectural’ .17 Mann claimed he had had ‘the hearty cooperation of the clergy and ministers of all denominations’18 and this certainly seemed to be the case in Pembrokeshire. Following the report, there was further criticism in the House of Lords, including claims that the data were ‘tainted with fraud ‘ and that errors were committed because ‘ … [Nonconformist] ministers were not often in the same rank of life as the Clergy of the Established Church’ .19 The then bishop of St. David’s, Connop Thirlwall, supported this claim.20 This may have specifically mentioned Pembrokeshire but unfortunately bishop Thirlwall’s exact contribution could not be traced. A further criticism of the data was that varying ways of reporting children in Sunday schools were used. In some cases they are included in attendances but in others listed separately. It should also be noted that many adults attended Sunday schools and may have been listed as Sunday Scholars. This would have added to the inaccuracy and perhaps favoured Nonconformists. However the Times described the Census as ‘accurate and trustworthy’ and the Christian Remembrance says ‘… on the whole the Church of England may accept the general result as a not very untrue picture’ (quoted in Pickering). 21 There were other criticisms of the Reli­gious Census and its Report both at the time of the Census and afterwards some alleging that it favoured the Church of England and others Noncon­formists. These criticisms both contemporaneous and modem appear to be largely general in nature and no specific criticism of the Pembrokeshire returns could be found. Horace Mann used his invented formula in an effort to eliminate potential misrepresentations in the Census Returns. More recently, other formulae have been used for this purpose including the best attended service of the day as a percentage of the population.22 Ieuan Gwynedd Jones in his introduction to the Calendar 23 reports using an ‘Index of Attendance’ in his studies of religious observance in Swansea, Caernarfonshire and Brecon and Radnor. It involves adding together the attendances at every service held at an individual church or chapel and expressing this as a percentage of the total population of the parish. This is used to compare the relative attendances of the chosen area. However Vickers 24 argues the most objective figure for comparisons is the total attendance. Therefore in the summary of data that follows (Table 2), both these sets of figures are given. It should be noted that the figures are likely to be skewed by a number of factors. These include: errors in original data and transcription; missing or non-returns – these have been omitted from calculations; churches or chapels with no service on Census day – but where a return has been made this has been included; variations in including Sunday school scholars as attendees – where these are separately identified in the Calendar they are not included; some parishes are partly in other counties – in these instances Pembrokeshire population has been used but total attendances for calcu­lation. These would include attendees from other counties not included in the Pembrokeshire population quoted; some parishes are detached, e.g. Caldey Island – their (small) populations are included in total population but not in religious returns. There are discrepancies in total population figures for Pembrokeshire viz Parliamentary Paper LXXXIV gives 84,472 and in a different place 94,140.25 Volume II of the Calendar based on Registration Districts gives 87,672.26 This figure agrees with that in Calendar, Volume 1. The com­puted figure from the returns in the Calendar is 89,285. This figure is used to calculate percentage attendances. There are a few discrepancies in these data compared with the Census Report. For example, there are no Moravians in the Report but one in the data above, no Latter Day Saints above but one in the Report. There are also four ‘undefined’ denominations in the Report. Other discrepancies may largely be accounted for by the use of Pembrokeshire in Table Two, but the Registration districts in the Report. Table 2: Attendances at Places of Worship in Pembrokeshire, March 30, 1851; computed from Calendar data·. **** Nine places stated ‘ Wesleyan Methodists. In fact, very little notice of the Report and results of the Census were taken in Pembrokeshire, or indeed in the whole of Wales.29 There was something of a rekindling of interest in the data by the Liberationists in their campaign for Disestablishment a few years after the Report and that was virtually all. However, the contemporaneous opposition to the Census was successful in preventing further formal and official religious Censuses and questions on religion in subsequent years. The 1851 effort remains the only example of its kind in the UK. There has been more enthusiasm about the religious census by twentieth century writers. Many have criticised its methodology and accuracy and some argue that ‘its results were sufficiently inaccurate as to damn the census as worthless’ while at the same time saying ‘the [Census] Report is of value to sociologists as well as historians’.30 The Census has been called a ‘useless experiment’ .31 It is difficult to share the view that it was an experiment, as there is no evidence that it was a trial for anything more elaborate or that any hypotheses were being tested, the usual prerequisites for experiments. It merely seems to be part of the development of social statistics, surveys and parliamentary reports dealing with many aspects of national life during the mid-nineteenth century. Ieuan Gwynedd Jones in his introduction to the Calendar regards the Census as a major source for the study of the history of religion in Wales but bemoans the omission of a question about the language in which services were conducted. He also believes that some chapel officials might have had some difficulty in understanding the questions because there was no Welsh version, 32 and regards the ‘ remarks’ column as often providing important and interesting information about particular congregations and regions, some being long and detailed statements. The general view of historians seems to be that despite its faults, the Census data do a great service. No other document , before or since , has revealed the demographic state of religion at a particular and specific time. And regarding religion in Pembrokeshire on March 30, 1851 , this writer can do no better than slightly modify Ieuan Gwyn Jones, writing in 1976. 33 The Census, if it has any significance at all, is eloquent of the fact that by the 1850s the pattern of religious adherence in Pembrokeshire (and indeed in Wales) which was to survive in its main characteristics for over a hundred years, had already been established. The research work on which this paper is based was originally developed as part of assessment for the MA in Local History Course at Trinity College, Carmarthen. J. Vickers, The 1851 Religious Census (London: The Historical Associa­tion, 1995), 2. 2. Ieuan Gwynedd Jones and David Williams, The Religious Census of 1851: A Calendar of Returns Relating to Wales, Volume 1: South Wales (Cardiff, 1976). 4. Parliamentary Papers, 1851 , Vo XLVIII (1339), 41. 7. David Williams, ‘The Census of Religious Worship of 1851 in Cardiganshire,’ Ceredigion, IV. 2 ( 1961) , 116. 10. Calendar, op. cit., xvi. 12. Calendar, op. cit., xix. 13. Parliamentary Papers, 1852-1853, XXXXIX (1690). 14. J. A. Vickers, op. cit., 4. 15. Horace Mann, Journal of the Statistical Society, XIII (1855), 147 quoted in David Thompson, op. cit., 91. 16. Owen Chadwick, op. cit., 365. 17. Census of Great Britain 1851 Religious Worship (Abridged Version), London, 1853, 2. 18. W. S. F. Pickering, op. cit., 389-390. 19. Hansard, 3rd Series 185I, CXXXV 1851, 35. 20. Hansard, 1860 CLIX 1717 quoted in Owen Chadwick, op. cit. 21. W. S. F. Pickering, op. cit., 387. 24. J. A. Vickers, op. cit ., 3. 25. Parliamentary Papers, LXXXIV, xviii and xxiii. 26. leuan Gwynedd Jones and David Williams, The Religious Census of 1851: A Calendar of Returns Relating to Wales, Volume 2: North Wales (Cardiff, 1981) (Un-numbered frontispiece). 27. John Davies, A History of Wales (Harmondsworth, 1994), 422. 28. Unpublished Notes. MA Local History, Trinity College, Carmarthen, 2004. 30. W. S. F. Pickering , op. cit ., 382-383. Although not tied to any particular denomination or institution, Evangelic­alism was an extremely important variety of Protestant Christianity. Evangelicalism emerged during the 1730s and exerted a powerful influ­ence on society and culture during subsequent decades. This dynamic · religious and ideological movement changed over time but is generally accepted as having four defining theological characteristics. Conver­sionism; [acceptance of Christ as one’s saviour] Activism; [efforts to bring about the conversion of others] Biblicism [the source of all spiritual truth] and Crucicentrism, the latter being ‘the most compelling testimony both to the power of sin and to the sacrificial love of God ‘.1 Individualism was also a pronounced tendency of Evangelicals. One of the most compelling reasons for studying Evangelicalism in the nineteenth century is the variety of consequences caused by its diffusion throughout society. The capacity of Evangelicalism to facilitate community building, or in extending the role of women in a general sense, is well attested. Evangelicals often played major roles in the major social issues of the nineteenth century. Without doubt the greatest of these, in the early 1830s was the campaign for the abolition of slavery which still existed in the British Empire. The abolitionist crusade had already been successful in ending slavery within the British Isles in 1807. This assumption, together with their moral philosophy, was given an extraordinary and positive dynamic of their own by Evangelicals who transformed them into a religious key.6 Traditionally, the abolitionist movement has always been represented as the apogee of Evangelical humanitarianism; the triumph of the doctrine of social responsibility. The vitality of British Protestantism accounted for a large part of the success of the British anti-slavery movement 7 laying the foundation for Christian reform action.8 but it perhaps more accurate to say that the movement was delineated along the lines of religious morality rather than humanitar­ianism. This narrow orthodoxy left little room for concern ‘with the plight of any other points of human suffering’ .9 Thus nonconformists were often ambivalent concerning other social issues and did not share an equal enthusiasm for the working classes, or workhouse inmates as they did for slaves. Nothing short of immediate emancipation would do although the govern­ment’s proposed scheme of apprenticeship for slaves and grant of £20 million for the planters and slave-owners excited much controversy [such recompense was seen as rewarding the criminal for the loss of his stolen property].21 The Emancipation Bill became law on 29 August 1833, with slavery officially abolished on 1 August 1834. The six years of apprentice­ ship which some slaves were to serve was seen as a more subtle form of slavery which thus officially ended in 1838. Fig. I: Bronze/copper medal, probably by Halliday, commemorating the passing of The Abolition of Slavery Act 1833 . The obverse depicts King William IV seated beneath a canopy attended by four statesmen. 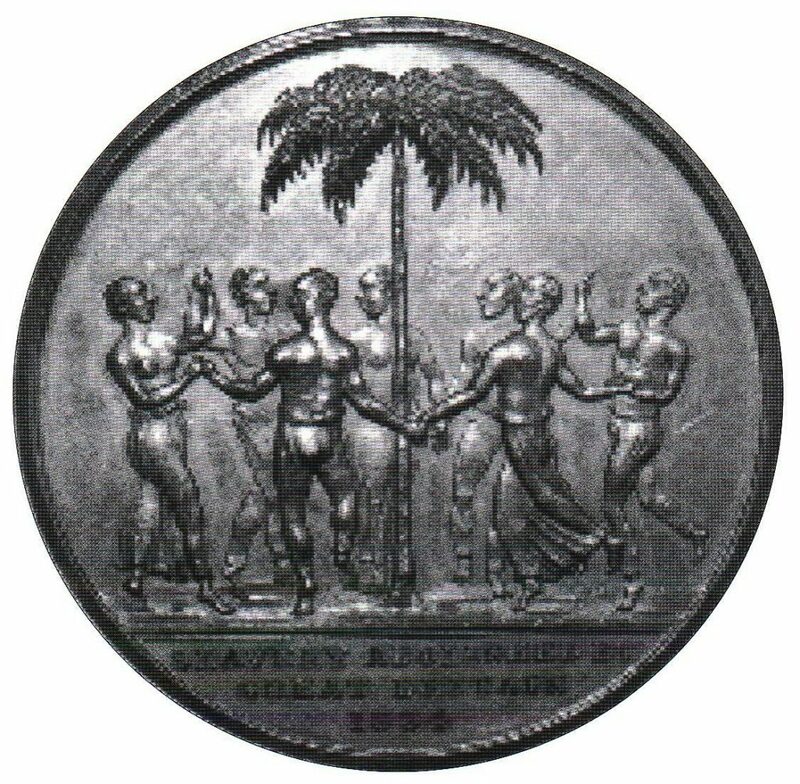 The reverse shows seven freed slaves dancing around a palm tree. (Published courtesy of the British Museum. Ref. No . M622). On Tuesday 24 May 1832 a meeting of the burgesses and inhabitants of Carmarthen took place at their Guildhall to hear the Rev. J. Thomas, the resident Wesleyan Methodist minister in that town argue that slavery was an evil ‘to which the tyrannical passions of men gave birth’. Moreover, he stressed the starkness of the issue: ‘slavery and Christianity are as much at variance as light and darkness, as Christ and Belial.’ 25 Similar arguments were being advanced across Wales. At Wrexham Town Hall in September 1832 a Mr Baldwin stated that since he based his anti-slavery arguments on eternal truth, they must command universal assent. Slavery, he asserted, was against the feelings of humanity and against the laws of God. Fig. 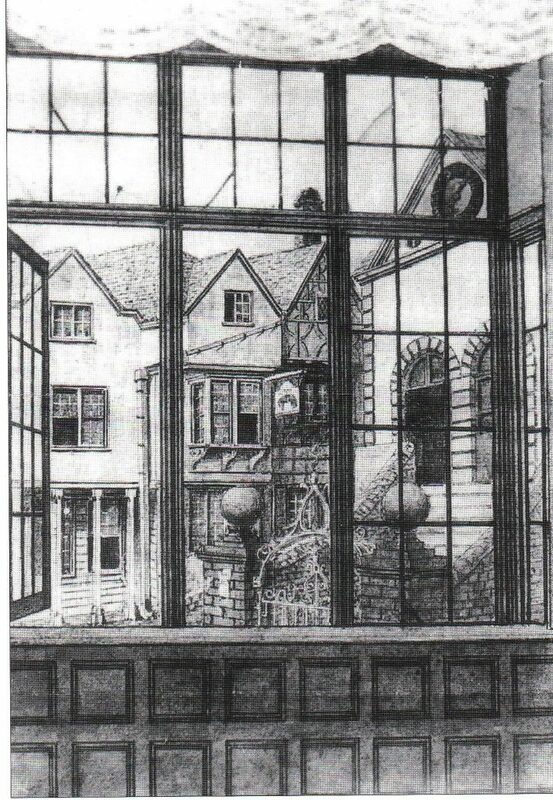 2: Drawing of the Guildhall at the top of High Street, Haverfordwest [probably drawn by Thomas Ellis of Short Row School in the 1820s], the venue for several anti-slavery meetings. The anti-slavery campaign witnessed an unprecedented pet1t10ning of legislators. The point has been well made that these petitions were no mere aggregate of signatures but rather the end product of expenditures of energy, money and resources. Almost all the petitions resulted from public meetings called for abolition. 50 They were an accurate reflection of public opinion on that issue and were a potent symbol of an Evangelical ‘people mobilised ‘.51 Gathering petitions required quite complex social and religious networking sometimes over large geographical areas. 55 petitions arrived and 200 more followed on 26 April. Another 200 were handed in on 13 May and an astounding 500 on 14 May.56 It has been estimated that one and a half million people signed anti-slavery petitions, an impressive tally for a movement in which Evangelicals were prominent. The difference in the balance of public opinion as expressed in petitions was truly startling. The Welshman of 12 July 1833 reported how, up to that time, 4,603 petitions had been sent to Westminster, containing 1,209,355 names urging abolition, whilst only one petition, containing a mere 391 signatures, called upon Parliament to resist immediate emancipation. At Haverfordwest the Rev. Daniel Davies referred to the deliberate policy of the planters in seeking to banish Methodist missionaries from Jamaica since ‘Methodism in every form, whether under a surplice or black coat, is equally offensive to them and their trade’.67 We are in no doubt that Christian missionaries were seen from an Evangelical perspective as bringing light, hope and the message of a saving gospel to the slaves. Interference or persecution of that mission was singled out as being especially wicked. There is very little evidence of women’s activism or even attendance at these anti-slavery meetings. It may be that their presence was just not recorded. At a Carmarthen meeting all ten speakers were male 68 and there is no reference to women heing in the audience. In Pembrokeshire the requisition to call the anti-slavery meeting was signed by seventy-seven men.69 When Daniel Davies chaired the Haverfordwest meeting he opened with the words ‘gentlemen’ .70 Perhaps the undoubted involvement of women, which certainly took place nationally, was more pronounced in an urban, metropolitan context that in rural areas like west Wales. We can learn much about the Evangelical influences in this area of social concern by examining the balance of leadership and engagement between Anglicanism and Nonconformity. Secondary literature seems to suggest a general correlation between the growing British anti-slavery movement and the rise of Evangelical nonconformity.74 However, the campaign reached well beyond the confines of organised nonconformity and was often communally rather than denominationally based, initially at least. That said, anti-slavery societies did establish particularly strong links with the Wesleyan Methodists and Baptists in 1831-1833. 75 Although some bishops might have feared that if slavery was abolished tithes might be next; many Anglicans were active in anti-slavery ranks. Determining the balance of religious and secular leadership in a local context is very challenging . Communal-based organisations, sometimes with popular, radical support, also made vigorous efforts in the abolitionist campaign. Religious denominations accounted for 56% of anti-slavery petitions in 1833 but rather less than 27% of actual signat ures. 78 The often middle-class nature of Evangelicalism could blunt its appeal to the wider population. The number of signatures mobilised against granting Roman Catholics political rights attracted nowhere near this level of support. It might be reasonable to conclude that the anti-slavery campaign of 1832-1833 represented the confluence of religious and secular influences, although the religious aspect remained far more important than most other influences. At Haverfordwest the main movers behind the anti-slavery meeting were from both secular and clerical worlds. The former included the county gentry, including J. H. Allen of Cresselly; a local medical practitioner, John Howell MD; an elected politician, Sir John Owen MP and a secular high-ranking official, the High Sheriff of Pembrokeshire.79 After the royal assent to the Emancipation Bill on 29 August 1833, further agitation followed regarding the thorny issue of the ‘ apprenticeship ‘ provisions for the freed slaves. As well as freeing some 800,000 black slaves, the cam­paign had tangible consequences for increased optimism in society and in a teleological belief in progress in the human condition . The synthesis of religious and political action ‘had profound implications for middle class optimism and the idea of progress’80 and represented a shining light that religious principle could indeed triumph over com­mercial considerations. It is asserted that the world benefited morally from the abolition of slavery within the British Empire and provided a dynamic thrust forward to the notion of a universal God alive in the world. I. John Wolffe, ‘Evangelicals, Women and Community in Nineteenth-century Britain’ (Milton Keynes, 2000), 18. 2. Ernest Marshall Howse, Saints in Politics, the ‘Clapham Sect’ and the growth of Freedom (London, 1952), 32. 3. Oliver Warner, William Wilberforce and His Times (London, 1962), 103. 4. D. W. Bebbington, Evangelicalism , in Modern Britain. A history from the 1730s to the 1980s (London, 1989) , 71. 6. Howse, Saints in Politics, op. cit. 7. 7. Edith F. Hurwit z, Politics and the Public Conscience. Slave Emancipation and the Abolitionist Movement in Britain (Lo ndon, 1973) , I 5. Great Britain and the Colonies, /8 /5 – /865 ( Londo n, 1970), 40. 11 . The Cambrian, 15 June 1832. 12. The Cambrian, 24 October 1834. 13. Hurwilz, Politics and the Public Conscience, op. cit., 44. 14. Roger Anstey, ‘The pattern of British abolitionism in the eighteenth and nine­ teenth centuries,’ Christine Bolt and Seymour Drescher [eds. ], Anti-Slavery, Religion and Reform: Essays in Memory of Roger Anstey (Folkestone, 19 80) , 21. 16. Roger Anstey, The Atlantic Slave Trade and British Abolition 1760- 1810 (Lon­ don, 1975), 190. 18. D. W. Bebbington, The Nonconformist Conscience. Chapel and Politics 1870- 1914 (London, 1982), 16. 19. Hurwitz, Politics and the Public Conscience, op. cit., 22. 20. R. G. Cowherd, ‘The Politics of English Dissent, 1832-1848’, Church History (Vol. 23, No. 2, 1954), 136. 21. Howard Temperley, British Anti-Slavery 1833-1870 (London, 1972), 271. 22. D. W. Bebbington, The Nonconformist Conscience, op. cit., 14. 23. Sir George Stephen, Anti-Slavery Recollections in A Series of Letters Addres­sed to Mrs Beecher Stowe  , (London, 1971), 160. 24. The Cambrian, 3 February 1826. 25. The Welshman, 11 May 1832. 26. The Welshman, 14 December 1832. 27. Roland Thorne, ‘The Political Scene in Haverfordwest 1600-1974’, D. Miles [ed. ], A History of Haverfordwest (Llandysul, 1999), 219. 28. Anstey, Anti-Slavery, Religion and Reform, op. cit., 28. 29. Howse, Saints in Politics, op. cit., 163. 30. The Welshman, 2 November 1832. 31. The Welshman, 11 May 1832. 32. The Welshman, 25 January 1833. 35. D.W. Bebbington, Evangelicalism in Mod ern Britain, op. cit., 72. 36. Anstey, Anti-Slavery, Religion and Reform , op. cit., 27. 37. Louis Billington and Rosamund Billington, ‘A Burning Zeal for Righteous­ness: Women in the Anti-Slavery Movement 1820-1860’, Jane Rendall [ed. ], Equal or Different? Women’s Politics 1800-1914 (London, 1914) , 90. 38. Hurwitz, Politics and the Public Conscience, op. cit., 36. 39. Ibid., 144. 40. James Walvin, ‘The rise of British popular sentiment for abolition, 1787- 1832 ‘ , Anti-Slavery , Religion and Reform, 158. 41. The Welshman, 11 May 1832. 42. The Welshman, 21 December 1832. 43. The Welshman, 25 January 1833. 48. Report of the Agency Committee of the Anti-Slavery Society (1832), 3. 49. D.W. Bebbington, Evangelicalism in Modern Britain, op. cit., 136. 50. Seymour Drescher, ‘Public Opinion and the destruction of British Colonial Slavery’, James Walvin [ed. ], Slavery and British Society 1776-1846 (London, 1982), 25. 52. D. W. Bebbington, Evangelicalism in Modern Britain, op. cit., 72. 54. The Times, 12 June 1830. 55. Seymour Drescher, ‘Two variants of Anti-Slavery: Religious Organisation and Social Mobilisation in Britain and France 1780-1870’ , Anti-Slavery, Religion and Reform, 48. 56. Hurwitz, Politics and the Public Conscience, op. cit., 62. 57. The Cambrian, 23 February 1833. 58. Pembrokeshire Record Office. Haverfordwest Methodist Circuit accounts, 182 1- 18 3 7 . DFC/M/9/1. 59. House of Lords Journal, Vol. 63. 8 November 1830. 61. House of Lords Journal, Vol. 63. l l November 1830. 62. House of Lords Jou rnal, Vol. 63. 18 November 1830. 63. Roland Thorne, ‘The Political Scene’ , History of Haverfordwes t, op. cit., 216. 64. D. W. Bebbing ton, Evangelicalism in Mode rn Britain, op. cit., 133. 65. Michael Crafton, ‘Slave Culture, Resistance and the Achieve ment of Emanci­pation in the British West Indies 1783- 1838’ , Slavery and British Society, I 0 8. 66. C. Duncan Rice, ‘ The Missionary Context of the British Anti-Slavery Movement’, ibid., 15 9. 67. The Welshman, 25 January 183 3. 68. The Welshman , 11 May 1 832. 69. The Welshman, 11 January 1833. 70. The Welshman, 25 January 1833 . 71. Walvin, Slavery and British Society, op. cit., 54. 72. The Welshman, 11 Ma y 1832. 7 3. The Welshman, 25 January 1833 . 74. S. Drescher, Slavery and British Society, 34. 75. Anstey , Anti-Slavery, Religion and Reform, op. cit., 27. 76. The Welshman, 21 December 1832 . 77. The Welshman , 25 January 1833. 78 . S. Drescher, Slavery and British Society, op. cit ., 36 . 79. The Welshman, 18 January 183 2. 80. David Brion David, ‘Slavery and Progress’ , Anti-Slavery, Religion and Reform, 352. 81. Andrew Walls, ‘The Evangelical Revival, The Miss ionary Movement and Africa’. Mark A. Noll, David W. Bebbington and George A. Rawlk [eds. ], Evangelicalism. Comparative Studies of Popular Protestantism in North America, The British Isles and Beyond 1700-1900 (Oxford, 1994), 313.